About 40 species, mostly natives of the northern hemisphere. Besides the following, 10 others occur in the western parts of North America. Type species: Juniperus communis L.
Leaves all subulate, prickly pointed, verticillate: aments axillary. Small erect tree or shrub; leaves slender, mostly straight. Low depressed shrub: leaves stouter, mostly curved. Leaves of 2 kinds, scale-like and subulate, mostly opposite; aments terminal. Tree: fruit on short straight branches. Depressed shrub; fruit on short recurved branches. Juniperus communis L. Sp. PI. 1040. 1753. A low tree or erect shrub, sometimes attaining a height of 30° and a trunk diameter of 12', usually smaller, the branches spreading or drooping, the bark shreddy. Leaves all subulate, rigid, spreading, or some of the lower reflexed, mostly straight, prickly pointed, verticil-late in 3's, often with smaller ones fascicled in their axils, 5"-10" long, less than 1" wide, channeled and commonly whitened on the upper surface; aments axillary; berry-like cones sessile or very nearly so, dark blue, 3"-4" in diameter. On dry hills, Massachusetts to Alaska, south to New Jersey, North Carolina, Michigan, western Nebraska and in the Rocky Mountains to New Mexico. Ascends to 900 ft. in Pennsylvania. Also in Europe and Asia. The fruit, called Melmot berries, is used for flavoring gin. Called also Horse Savin, Hackmatack, Aiten. April-May. Fruit ripe Oct.
Juniperus sibirica Burgsd. Anleit. 2: 124. 1787. Juniperus nana Willd. Sp. PI. 4: 854. 1806. /. communis depressa Pursh, Fl. Am. Sept. 646. 1814. Juniperus communis var. alpina Gaud. Fl. Helv. 6: 301. 1830. A depressed or trailing rigid shrub, seldom over 18' high, forming circular patches often 10° in diameter. 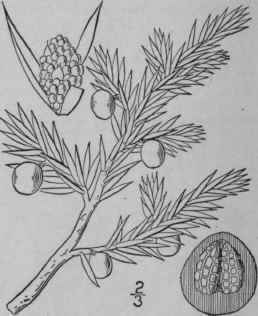 Leaves similar to those of the preceding species, but stouter, similarly channeled and often whitened above, appressed-ascending, rather rigid, spiny tipped, 4"-6" long, mostly incurved, densely clothing the twigs, verticillate in 3's; aments axillary; berry-like cones blue, 4"-5" in diameter. In dry, open places, Labrador to British Columbia, south to Massachusetts, New York, Michigan and in the Rocky Mountains to Colorado and Utah. Also in Europe and Asia. 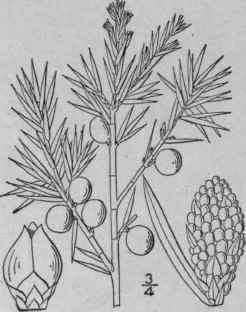 Although the characteristic growth in a depressed circular patch gives a very different aspect from the true Juniper, the plant may, perhaps, be better regarded as a race of /. communis L. April-May.